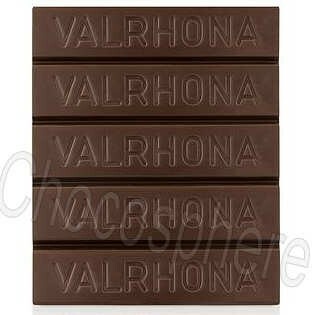 Valrhona Guanaja bittersweet dark chocolate is very intense. Guanaja is made with a blend of Criollos and Trinitaros cocoa beans from South America. Valrhona's blend of grand cru cacao in Guanaja reveals an aromatic and complex range of fruit, coffee, molasses and floral notes, with a long finish. Valrhona suggest Guajaja as being suitable for coating, molding, bar making, mousse, cream mix & ganache, and ice creams & sorbets. It is a great general purpose bittersweet dark chocolate. 70% Cocoa, 28% Sugar, 42% Fat Content. Available in large bloc and disc formats. 1Kg/2.2 Lb bloc repackaged by Chocosphere.